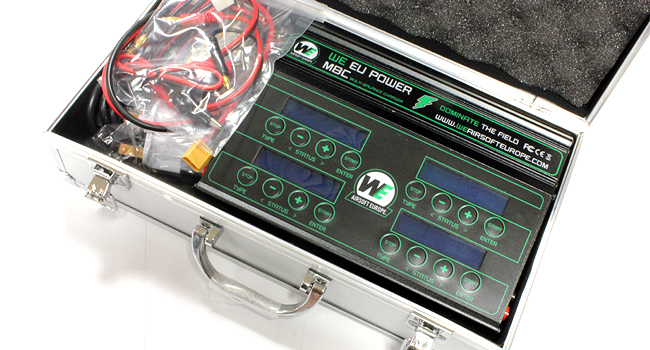 The new ultimate charger from WE Europe will charge 4 batteries at once. No need to run a charger for every battery with this you can charge up to 4 batteries from the same charger. Each battery can be a different type from LiPo, NiMh, LiFe, LiLo, NiCD, PB. Great for anyone who has to run different batteries for different guns or just has multiple batteries for one gun. Can run from the mains or from a 11-18v power source. Comes with a carry case to keep all the leads and charger together when being transported or for storage.